What happens if you give someone $1 and then take $1 from them? Nothing. 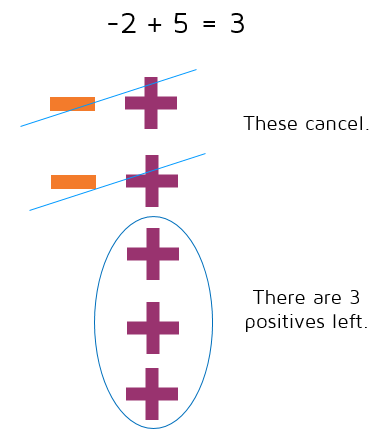 The same thing is true if you add a positive 1 to a negative 1, they cancel each other out. 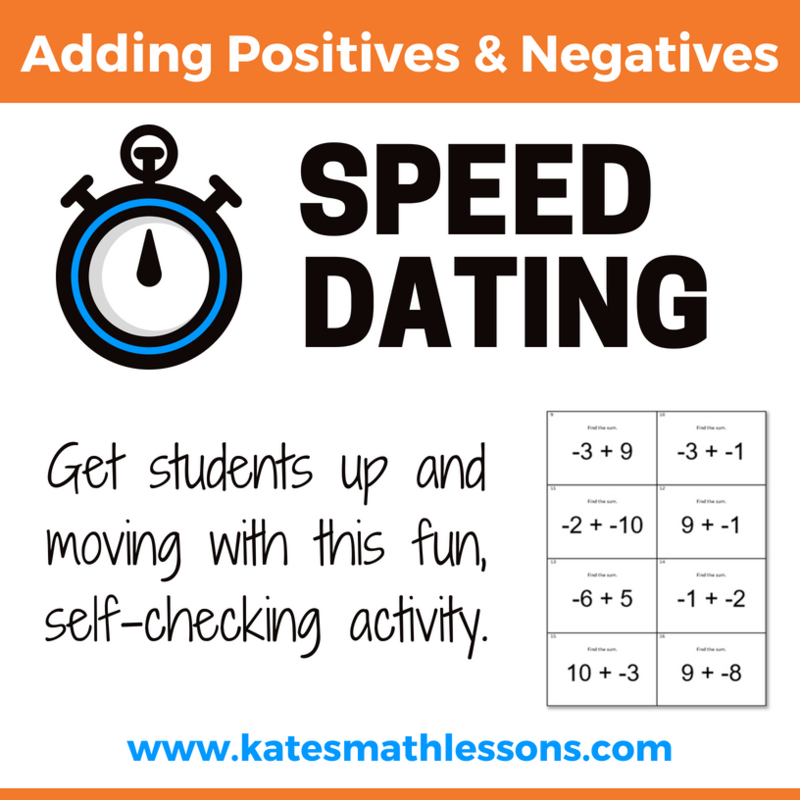 There are a few different ways you can visualize adding positive and negative numbers together. 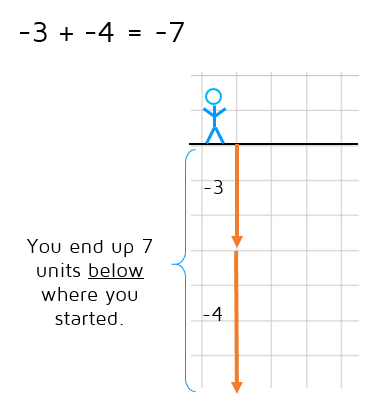 One way to think of adding positive and negative numbers is to imagine that you're standing at ground level. If you add a positive, you'll go up as if you climbed up a ladder. If you add a negative, you'll dig a hole down into the ground. Let's say you have -2 + 5. You can think of the -2 as digging a hole down into the ground 2 units. When you add 5, you need to go up 5 units from that hole. Where do you end up? At 3 units above where you started so the answer will be a positive 3. A second way you might visualize adding positive and negative numbers is to draw plus and minus signs. You know that a positive 1 and a negative 1 will cancel out if you add them together. When you draw your diagram, you can cross out the pairs of plus and minus signs and see what's left. Do you have to draw a picture every time? No, but finding a way to visualize the problem can be very helpful. 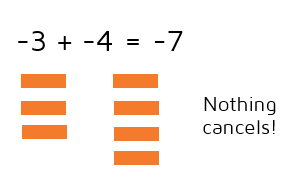 There is another way to add positive and negative numbers together without drawing a diagram. We know that positive and negative numbers cancel each other. The goal is to figure out what will be left over after things cancel. To do this, you can look at the absolute value of each number (just remove any negative signs and think of both numbers as positive). Subtract the two positive numbers and then look at the signs of the original numbers to see what the sign will be of your answer. Did you start with more negatives or more positives? This will tell you if you have positives or negatives left over. Subtracting will tell you how many are left. What happens if you add two numbers together and they're both negative? If both numbers are negative, they do not cancel out. If you borrow $1 and then borrow another $1, they do not cancel. You just owe the person even more money. When you add two negatives together, you'll end up with a negative answer. Let's say you are adding -3 + -4. One way to visualize this is to think of -3 as digging a hole down into the ground 3 units. When you add -4 to that, you need to dig the hole even deeper and go an additional 4 units down into the ground. Where do you end up? 7 units below where you started, so -3 + -4 = -7. 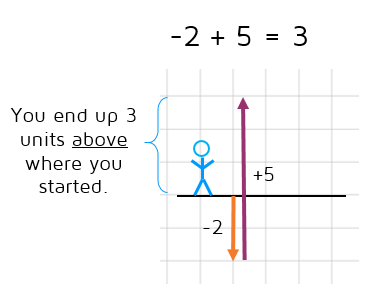 A second way to visualize this problem is to draw minus signs to represent -3 and -4. 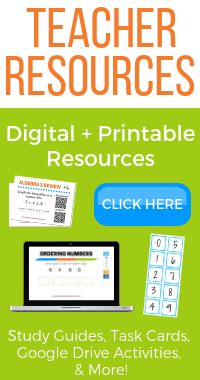 You can represent -3 with 3 minus signs and -4 with 4 minus signs. Since they're all the same sign, nothing cancels out and you're left with a total of 7 minus signs. If you don't want to draw a picture, you can use the absolute value of each number (take off the negative signs) to find the answer. If you add the two positive numbers together, this will tell you how many minus signs you have total. Then make your final answer negative because the original numbers were both negative. For example, to find -5 + -4, you can find the absolute value of both numbers: 5 and 4. Add these numbers together: 5 + 4 = 9. The final answer will be -9 because both original numbers were negative. -5 + -4 = -9.